ARTIFACTS Bryan Thompson is seeking a new home for his 1990 Nissan Pao. BRYAN THOMPSON has a cute little orphan that needs a home. 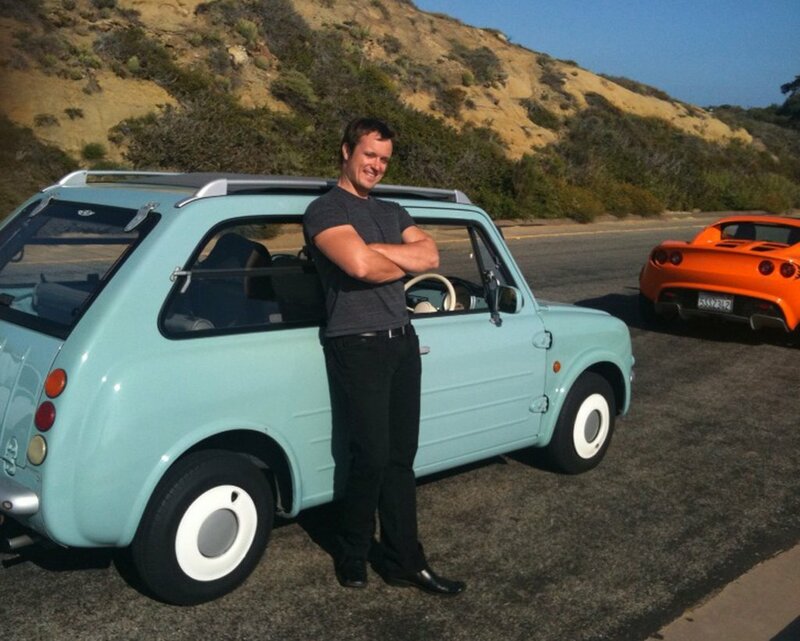 Mr. Thompson, a former Nissan designer who is now head of design at Next Autoworks, a start-up car company, is putting his light-blue 1990 Nissan Pao up for adoption. Until recently, the Pao, a model never sold in the United States, resided in the Datsun Heritage Museum in Murrieta, Calif., southeast of Los Angeles. But the museum has closed and is seeking to relocate, so Mr. Thompson plans either to sell the distinctive little car or lend it to an auto museum. “I just want the car safe and in good hands,” he said. Before 1984, Nissans were called Datsuns in the United States. The museum, established in 2008 by a former company sales manager, housed about 15 American Datsuns and some unusual Nissan models. Mr. Thompson said his Pao was one of only 10,000 built — and one of very few in the United States. The car, which has right-hand drive and did not meet American standards, was never licensed for street use in this country. The offbeat Pao was one of four limited-edition cars Nissan offered in Japan in the late 1980s and early ’90s. They were collectively known as the Pike cars because they were intended to represent the spearhead of a new approach: adapting design and marketing strategies from other industries like personal electronics. At the time, Japanese companies like Sony and Panasonic — along with automakers like Toyota, Honda and Nissan — were the envy of the world. The other Pike cars were the minimal Be-1, the snail-shaped S-Cargo van and the sporty Figaro convertible. The cars were as cute as Hello Kitty, radiating a cartoonish insouciance that spoke of Japanese confidence before a decade of stasis set in. The cars were based on the Nissan Micra (also sold as the March) and used its 51-horsepower engine. But it is more than abstract appreciation that led Mr. Thompson to buy his Pao. “The Pike cars influenced me to become a car designer,” he said. The Pao has its fans, but the most lovable of the Pike cars was probably the Figaro, whose expressive face is worthy of Pixar Studios. Better known was the S-Cargo, a van whose name was a pun on small cargo and escargot. Its rear cargo area, curved like a snail’s shell, was based on the French Citroën 2CV camionette, or small truck. The plain Be-1 looks generic. The Pao, in contrast, seems like a ride for the weekend with its canvas roof and ribbed sides. “The Pao was designed for drives through the countryside, and picnics,” Mr. Thompson said. His Pao is Aqua Grey, one of four colors inspired by 1950s hues. Raised ribs on the hood and doors emphasize the body’s thinness. Mr. Thompson likes this feature, along with the two-part tailgate and the instrument panel that looks like Bakelite. The Pike cars represented the height of postmodernism. Unabashedly retro, they were inspired by French and Italian designs of the ’50s, promiscuously combining elements of the Citroën 2CV, Renault 4, Mini, Fiat 500 and even the East German Trabant into an archetypal car. A decade later, the designer Mark Newson created a concept car for Ford, the 012C, in the same vein. Each type of Pike car was produced in limited numbers, essentially as fashion accessories for hip young Japanese. Today, the Pike cars are appreciated as forerunners of other high-style retro vehicles like the Volkswagen New Beetle, the Mini Cooper and the latest Fiat 500. Although Nissan did not heavily promote the cars — customers had to discover them, like an unmarked club — they exceeded expectations. The company held lotteries for the right to buy one. The designs were credited to Naoki Sakai, although Shoji Takahashi is also often mentioned as the Figaro designer. Mr. Sakai also worked for Olympus around the same time and designed the retro O-Product camera that helped to popularize the brushed aluminum look. Mr. Sakai also helped to design a Toyota version of the Pike cars, called the Will cars. An article on March 20 about the four limited-production Pike cars that Nissan once sold in Japan misstated their size classification there. They are not kei cars, which are lighter and less powerful models exempt from some Japanese taxes and regulations. Larger cars, including the Pike models, are not eligible for such benefits. A reader pointed out the mistake in March; this correction was delayed for research and by an editing lapse.